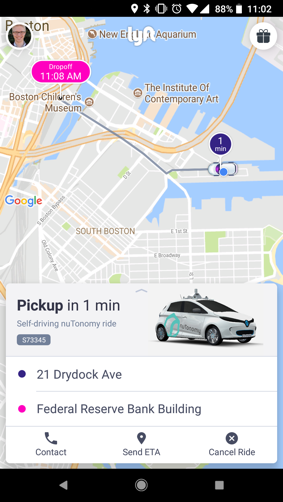 Lyft is beginning its self-driving car pilot with self-driving car company nuTonomy in Boston as it looks to ramp up its self-driving efforts, and is now matching its riders with self-driving vehicles in parts of Boston, nuTonomy said today. Lyft announced its partnership with nuTonomy in June this year, indicating that the pilots would begin in the coming months. It looks like the project is going to get out the door by the end of the year, which is a good sign for the company looking to capitalize on not only a pile of goodwill in the ridesharing industry but also getting the tech up and rolling. While it’s limited to a select part of Boston, getting those tests up and running is critical to get enough data to broaden the program. If you live in a metro area like San Francisco, you’ve probably become accustomed to seeing cars with whirling cameras on top of them rolling through the city. All this is an effort to collect additional data on the city and how traffic behaves in it — information that’s critical to create a self-driving car network that is both effective and safe. Perception is nearly as important as reality as companies like Uber and Lyft look to make self-driving cars part of the norm. The company said some Boston passengers in the Seaport area will be matched with self-driving vehicles when they request rides through Lyft. It will give some select consumers access to the sort of future-is-here experience of getting in a self-driving car for two companies that seem to be relatively unknown in a market populated by Waymo and Uber, which are both looking to create a massive network of self-driving cars. And to be sure, there’s an enormous amount of money that continues to flow into both autonomous driving and ridesharing. Delphi purchased nuTonomy for $400 million in October this year, and Lyft appears to continue to tack on additional financing with another $500 million this month. For Lyft, it’s an opportunity to tap a company that is looking to specialize in the technology, and it gives companies like nuTonomy access to an existing network immediately.